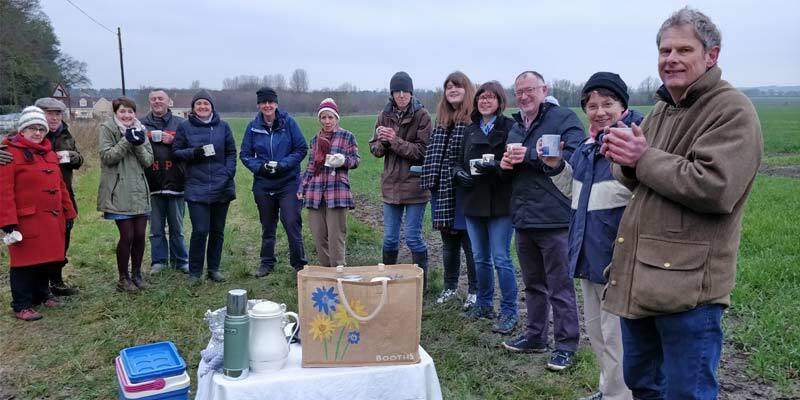 Whaddon and Bassingbourn parishes are part of the same benefice. 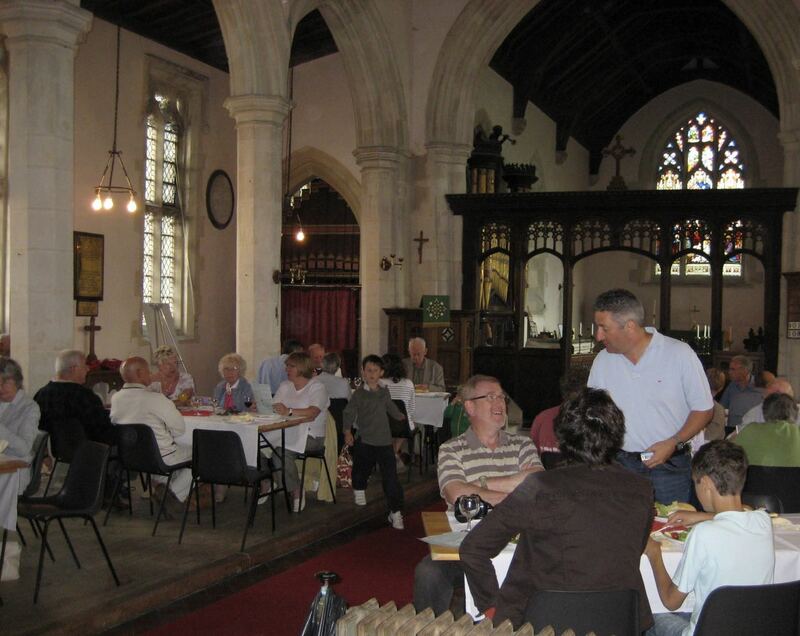 Follow this link to find out about St Peter & St Paul Bassingbourn. 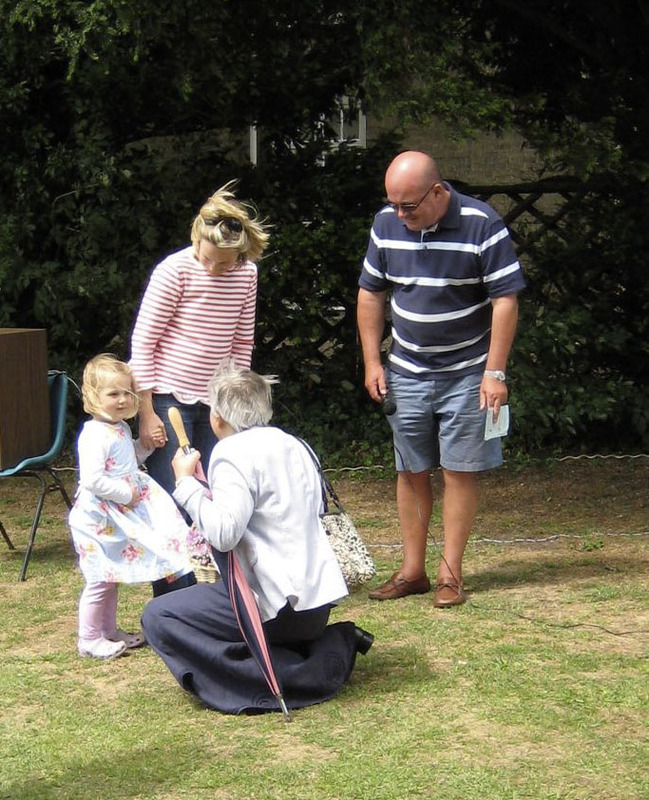 When there is a 5th Sunday, we worship together with Bassingbourn. Time and place varies, so please check the notice sheet. 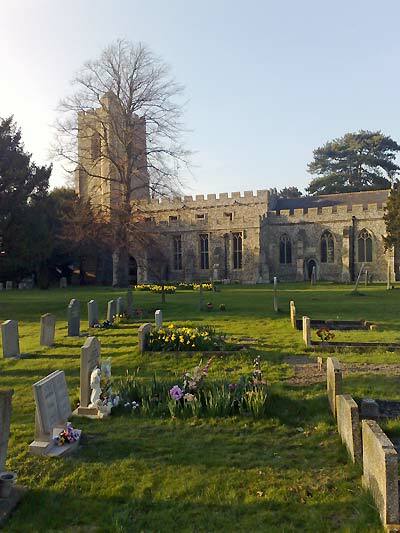 Notice of Revision of Church Electoral Roll for St Mary's, Whaddon. 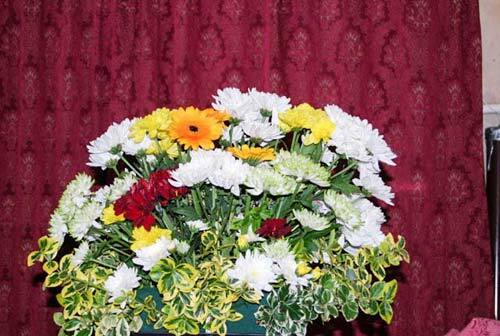 St Mary's Annual Parochial Church Council Meeting will be held at 19:30 on the 27th. It will be held in the Church and all parishioners on the Church Electoral Roll (see above) are invited to attend. 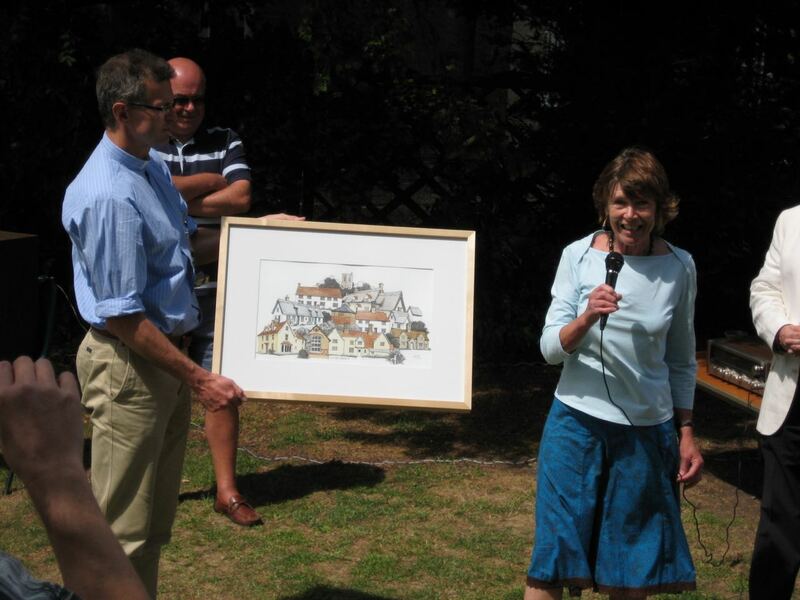 The Vicar of the benefice of Bassingbourn and Whaddon is the Rev’d Dr Caroline Yandell. 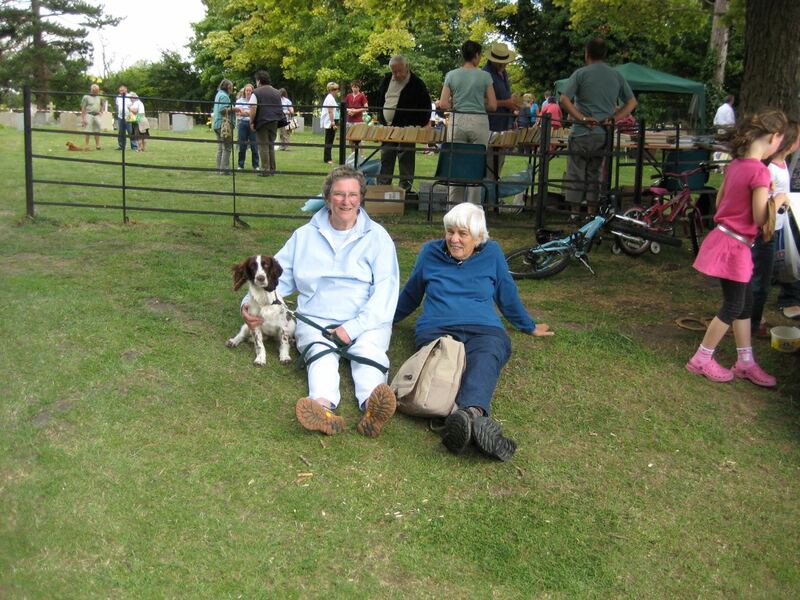 Caroline is usually available for Parish work on Sundays, Tuesdays, Thursdays and Saturday pm. The Church of Saint Mary, Whaddon, stands on a slight rise in the centre of the village which gets its name from the Anglo-Saxon Wadune, meaning Wheat Hill. There has been a church in Whaddon since at least Domesday when the names of priests Turbert and Ralph are mentioned in the Domesday Book. 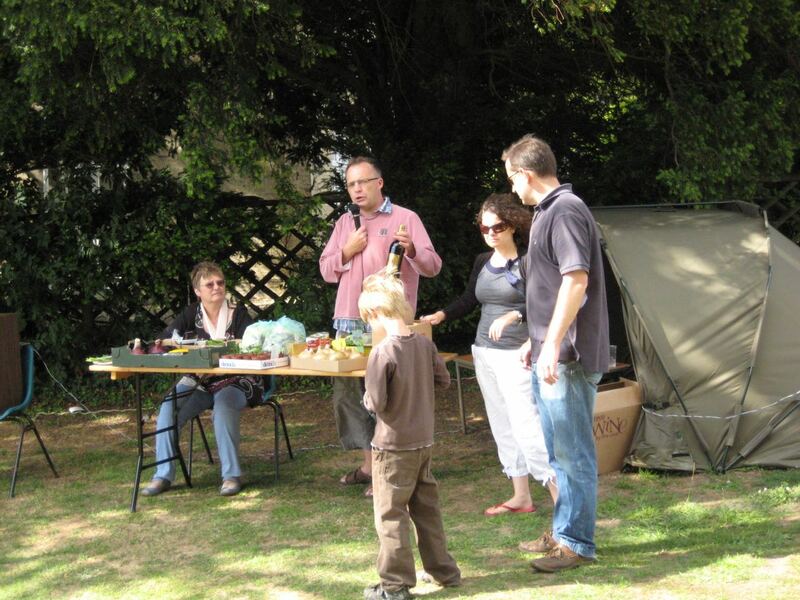 We do know that during the twelfth century, Hugh de Scalers, a member of the Norman de Scalers family, who owned of a large part of Whaddon for over 400 years, gave Whaddon church to Lewes Priory where Henry, his son, became a monk. The Priory later granted the church to King Edward III. 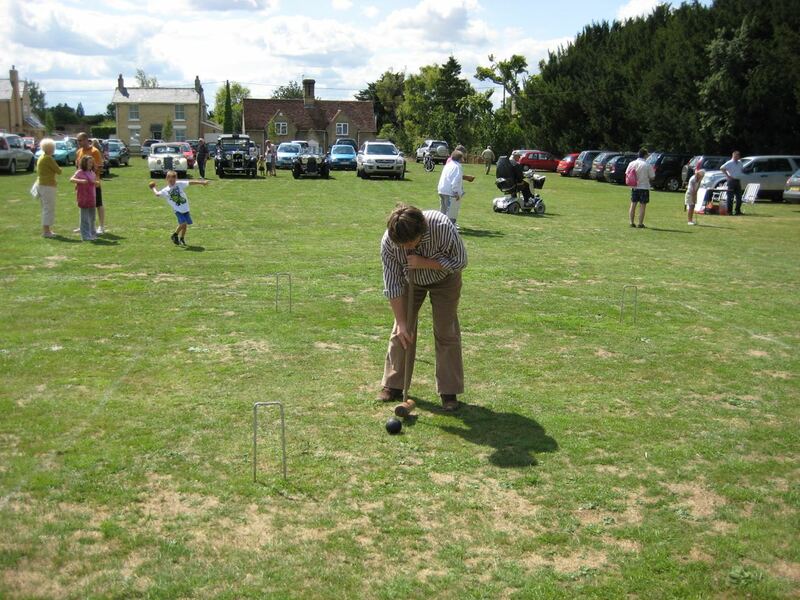 [For history and information about Lewes Priory, see this web site.] In 1351 it was granted to the Dean and Chapter of St George's Chapel, Windsor, who administered the estates and appointed incumbents. The estates were turned over to the Ecclesiastical Commissioners in 1867. 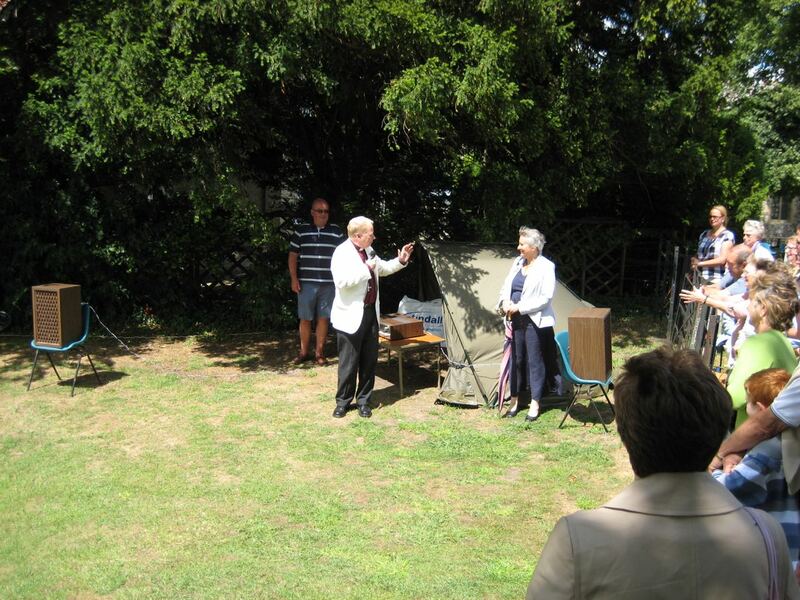 To this day the advowson (the right of presentation to a vacant benefice) remains with St George's Chapel. 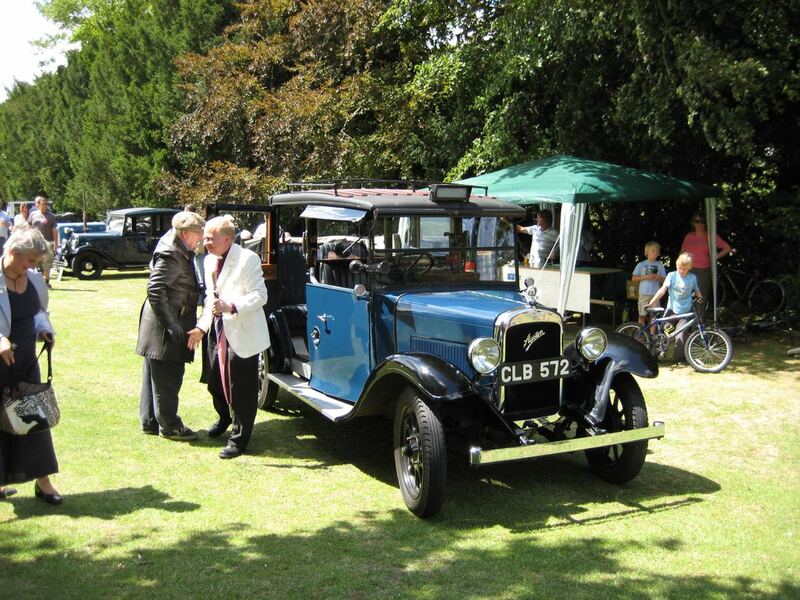 In 1932 the benefice was united with Meldreth but in 1952 this was dissolved and it was united with Bassingbourn. The present church is a very attractive building both externally and internally and is of various dates from the 13th to the 15th century. 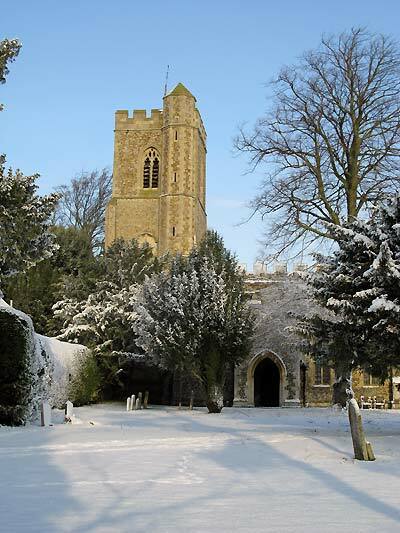 It is typical of churches in East Anglia being constructed of pebble and flint. Because of the low-lying countryside the square mediaeval tower with its battlements is easily seen through any trees and presents a lovely picture on the approach to the village from the A1198. 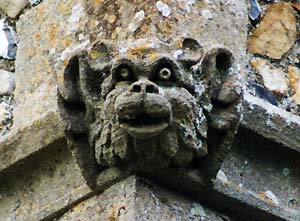 The church is in the Early English style of architecture; its outside cornices revealing many different carved faces, heads and designs beneath the battlements and beside the windows and doors. The most ancient parts of the church that remain are the dog-tooth moulding on the chancel arch, which dates back to late thirteenth century and the north and south arcades of the nave, but even these are not in their original proportions as changes have been made to them. During the fourteenth and fifteenth centuries the church seems to have been entirely rebuilt; and contains examples of both Decorated and Perpendicular styles of architecture. The clerestory with quatrefoil windows and square surrounds was added and the arcades were altered by resetting the arches and lengthening the pillars. 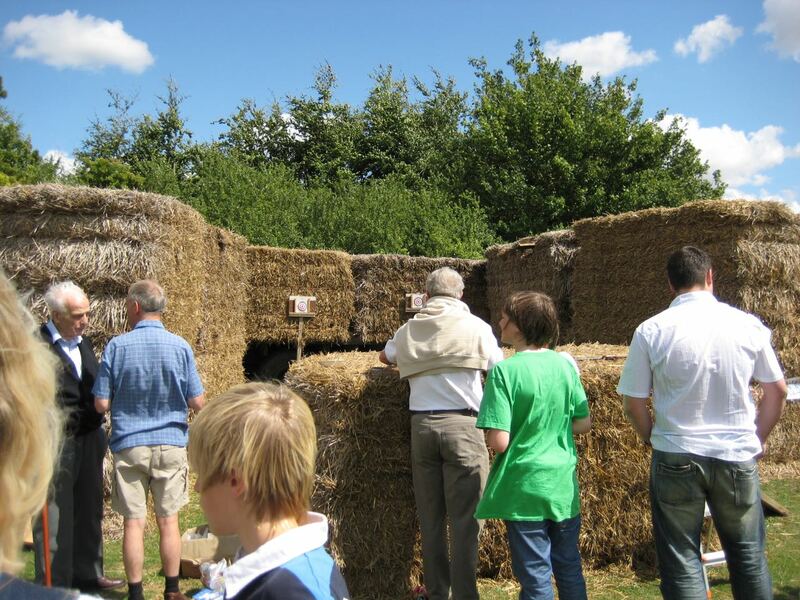 The arcade is of impressively tall Decorated octagonal piers, five bays long with double hollow chamfered arches. The aisle walls, with their tall and narrow two-light windows, their transoms and square heads filled with tracery show a transition from Decorated to Perpendicular. The tower arch goes with them and the whole west tower is Perpendicular. It has a stair turret higher than the battlements of the tower. A new three-light west window was put in and the chancel was rebuilt. The chancel arch has three-shaft responds, the dog-tooth moulding and some nail-head decorations in the capitals. 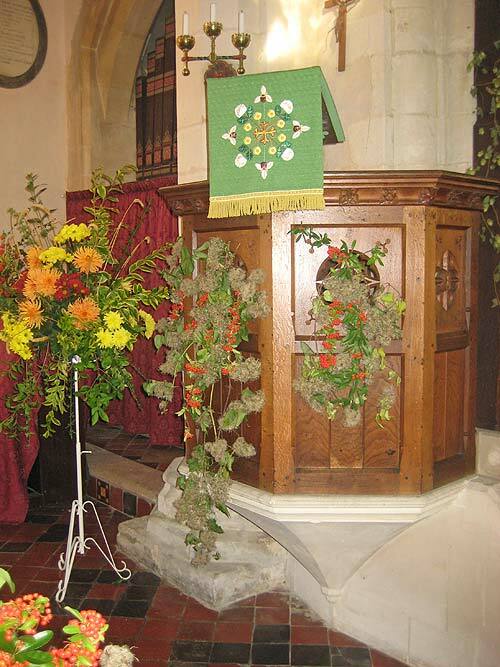 The font, the chancel rood screen and the fitting up the church with oak benches, the roofs of the aisles and the roof of the nave, which is of oak with finely carved bosses of animals, birds and flowers, were all installed at this time. 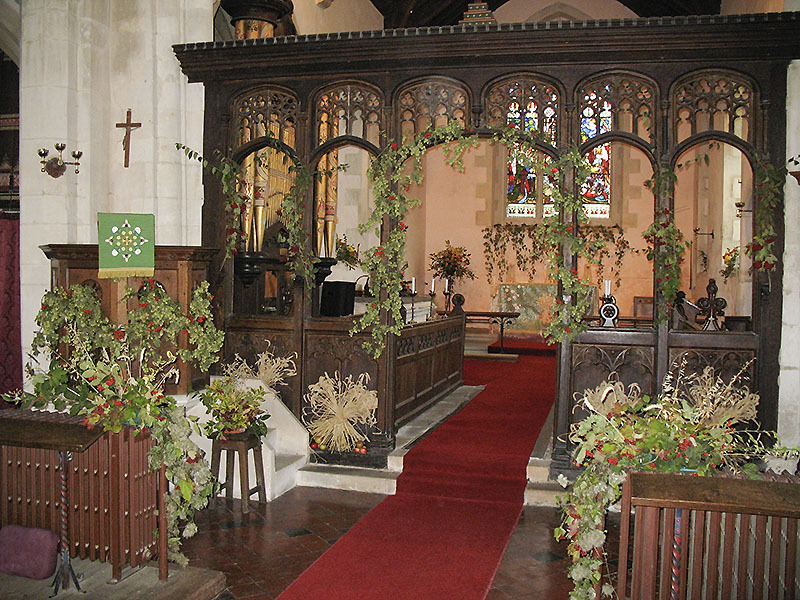 The chancel rood screen is oak. 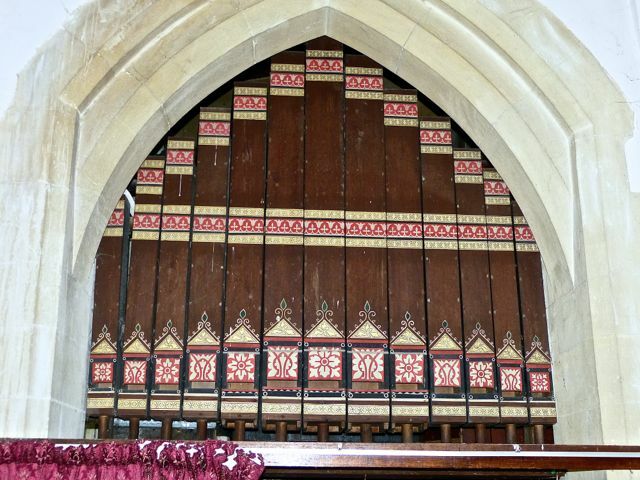 The divisions of the screen have simple tracery above the flattened arches and the lower panels are decorated with flowers and two carved figures rudely put out their tongues. 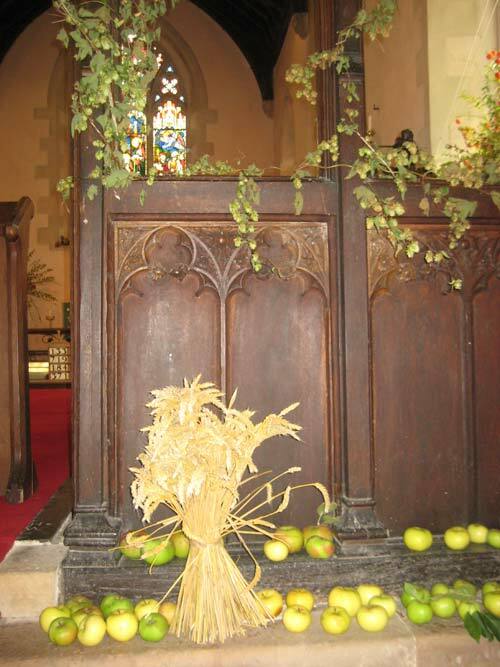 There is a heavy oak cross on the screen which used to stand on the altar. 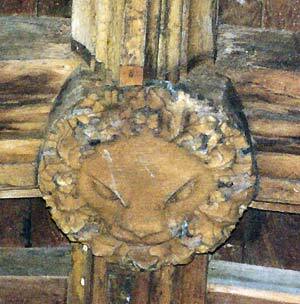 One interesting feature in the nave is what is obviously a blocked doorway to the right of the rood screen. 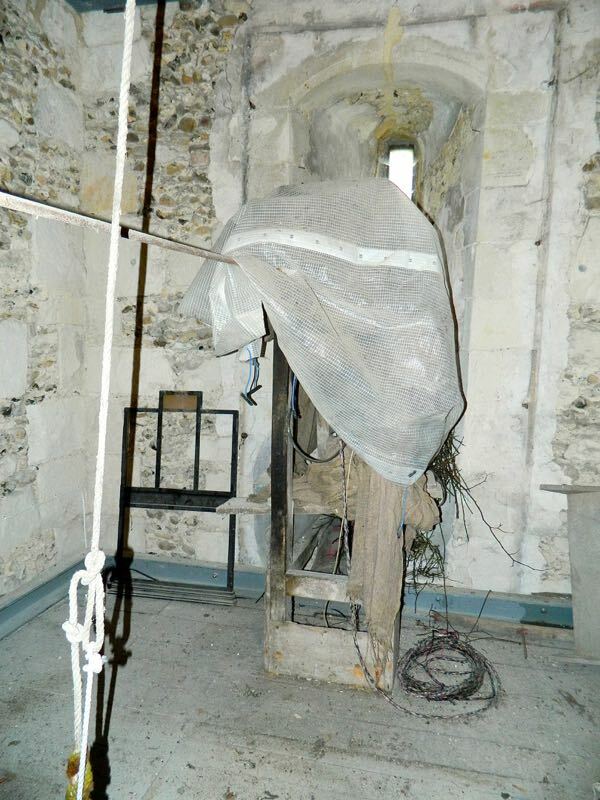 This could have been the entrance to a rood loft which the Reverend Clare, vicar of the parish from 1943 to 1952 and amateur historian, said that he had seen evidence of by indents for supports on the top beam of the screen. General notes: Listed in Cox & Harvey (English Church Furniture, London 1907) as a baptismal font of the Perpendicular period. Noted in Pevsner (The buildings of England, 1970): Font. 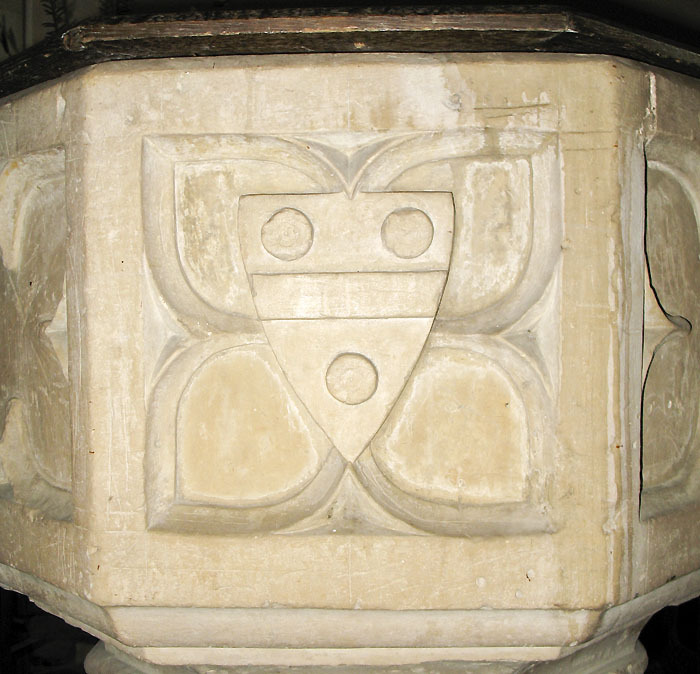 Octagonal, Perp[endicular], with blank arches on the stem and pointed quatrefoil panels on the bowl. Only one of them, that pointing E, has a shield. 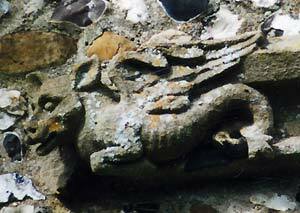 It contains the arms of the d'Eschallers family [NB: perhaps the 'Scales' family? (descendants of Hardwinus de Scalariis?) — cf. 'Cambridgeshire', LoveToKnow 1911 Online Encyclopedia. 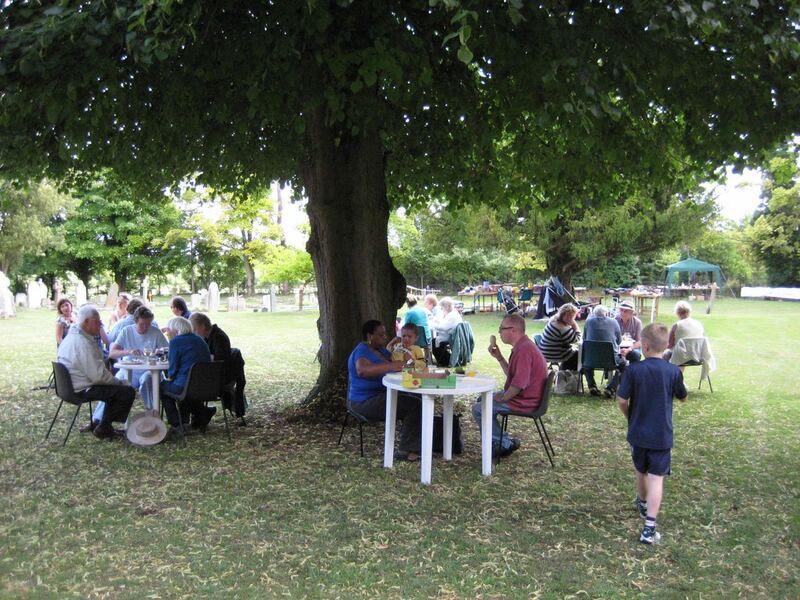 © 2003, 2004 LoveToKnow — http://64.1911encyclopedia.org/C/CA/CAMBRIDGESHIRE.htm)]. Noted in the Cambridgeshire Churches (2004): at the end of the north aisle, there is a contemporary [i.e., Perpendicular] font. Like the other 15th century work here, it is relatively plain: the only decoration is sober panelling on the shaft and seven faces of the bowl. The eighth, which faces east, has a carving of the shield of the d'Eschallers family, who were lords of the manor here between the Norman Conquest and the 15th century . 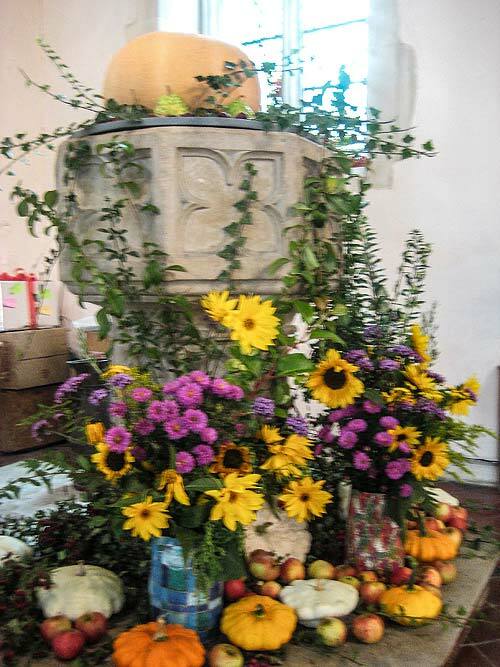 [We are grateful to Ben Colburn and Mark Ynys-Mon, of Cambridgeshire Churches, for their information on this font, and for the photographs of the church]. 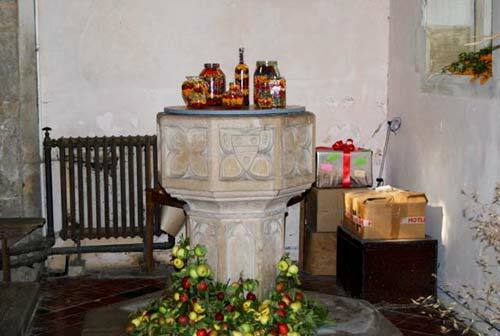 The Whaddon Church guide [http://whaddon.org/church/church_guide.html] [accessed 19 December 2007] notes: The font, by the north door, is octagonal in shape and bears the arms of the de Scalers on the eastern face. 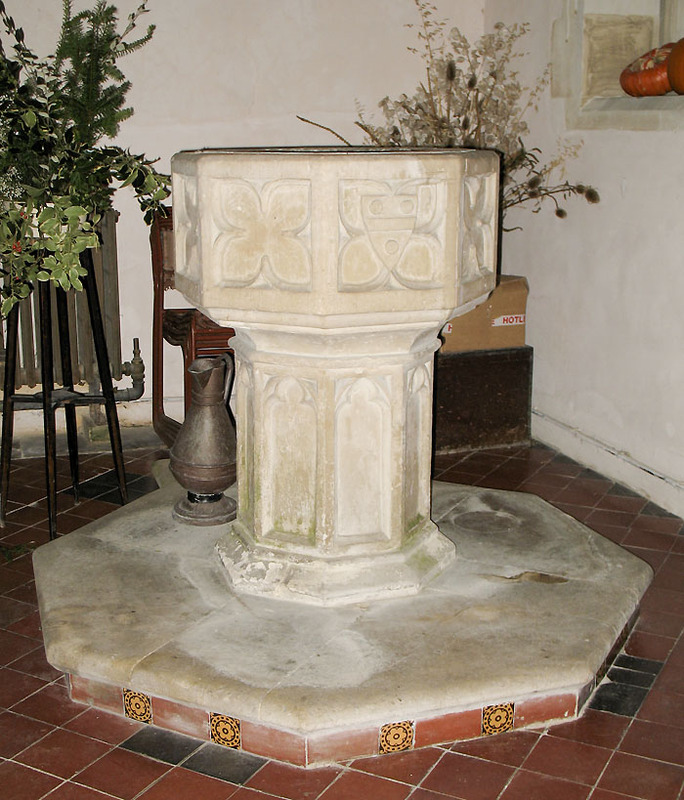 It would appear to have been without a cover at some time as in a visitation in 1685 it was reported: 'At Whaddon the font wants Cover and Plugge' [NB: there may have existed an earlier font in the 13th-century original church]. 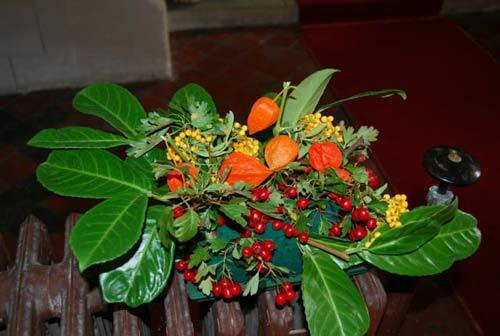 [We are grateful to Nigel Strudwick, of Whaddon, Cambs., for his photographs of this font]. A look up at the roof reveals carved bosses in the centre of the roof and carvings at the ends of the beams-all different. In 1852 the condition of the church was recorded as poor and the windows much mutilated and the west window was blocked. 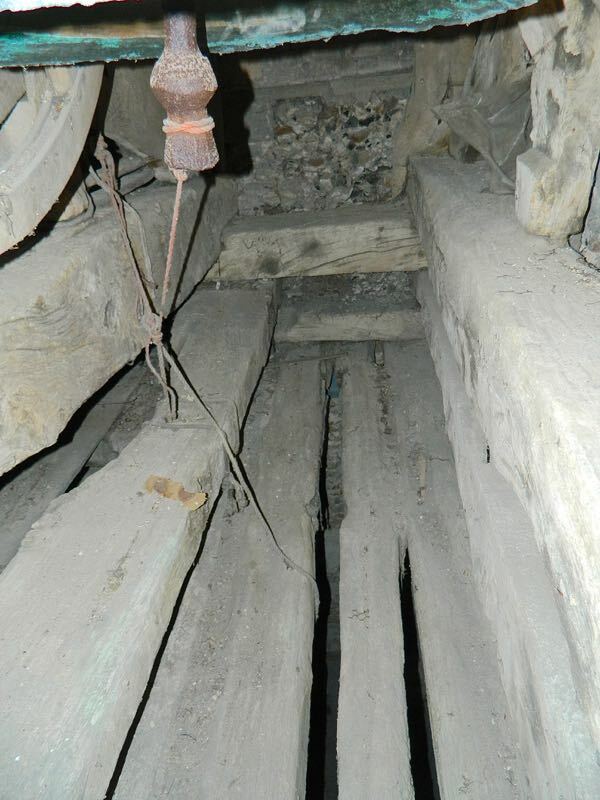 Lead was stolen from the chancel roof in 1835. By 1868, over £2000 was required for work on the restoration of the chancel, nave aisles, tower and the installation of an organ chamber. Further work was done in 1873. 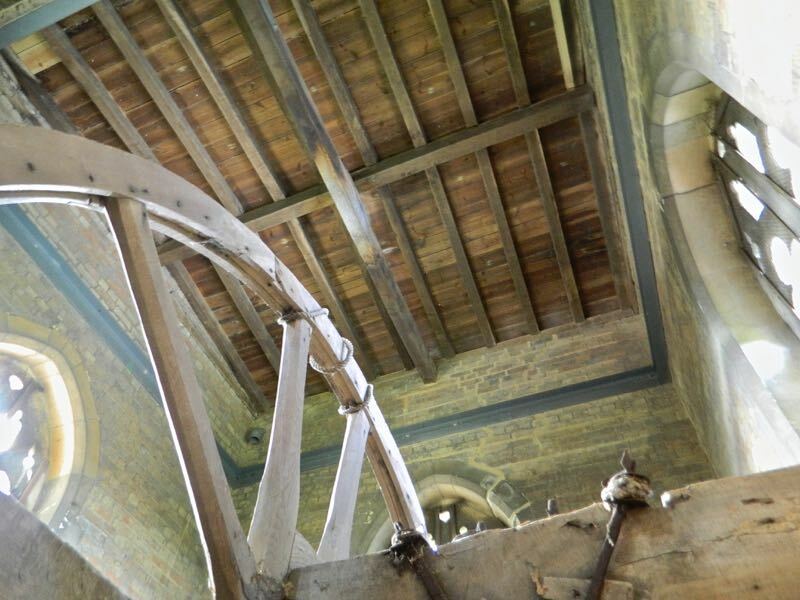 At the time the necessary work needed on the tower was left until a later date but a few years afterwards the structure of the tower showed signs of giving away and the upper part of the tower was taken down. For years afterwards efforts were made to raise the necessary funds for rebuilding the tower and eventually between March and September 1894 the work was carried out. 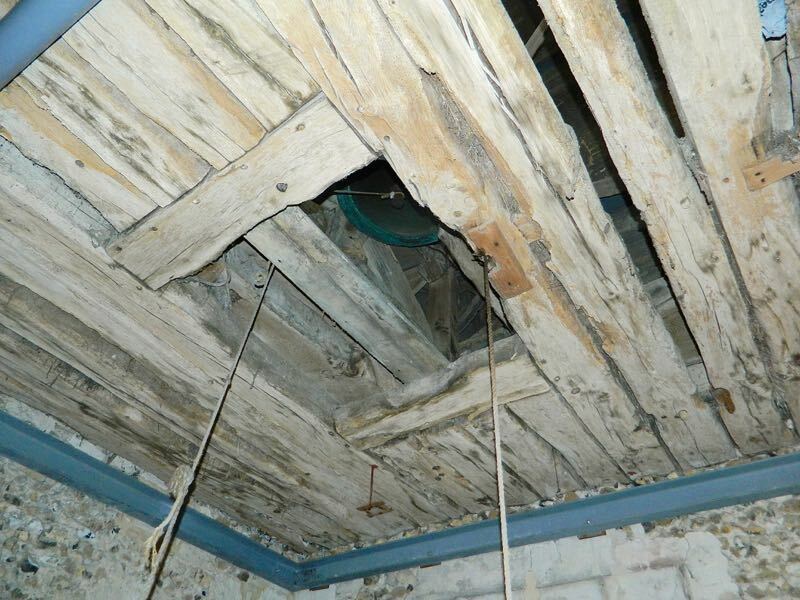 The cost of the restoration was about £500. A look at the south side of the tower below the top window will reveal the change in colour between the original flint and stone and the new. New windows were also donated at that time. 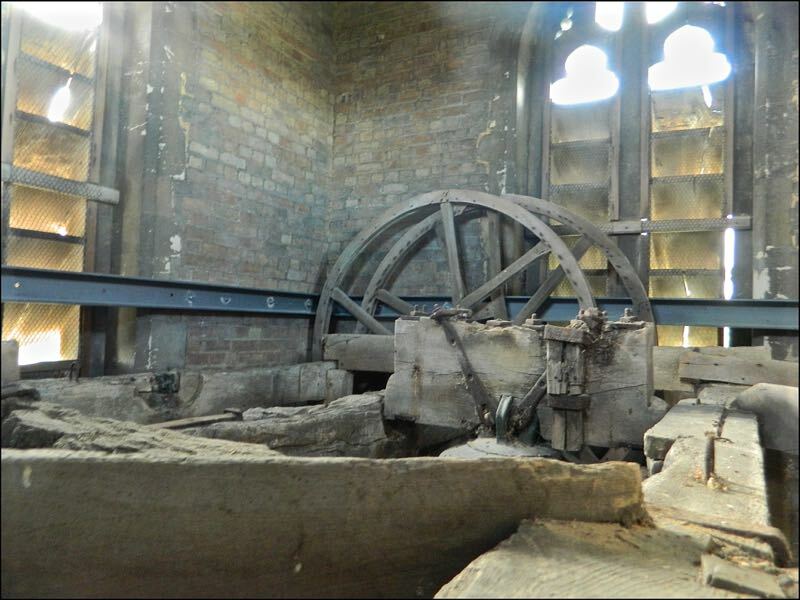 Further work was carried out on the chancel in 1949 when memorial slabs were uncovered and the floor returned to its mediaeval level. Clearly visible in the chancel are memorials, some with coats of arms, of influential members of the community. The first of these were the de Scalers. Scalers manor house stood south-east of the church, m the centre of the chancel is a marble slab of Thomas de Sealers and his wife - 1364 and beside the south wall that of John de Scalers - 1388. 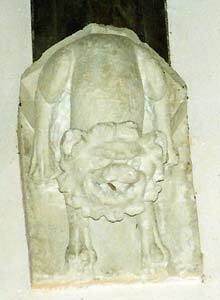 The large tomb in the chancel is that of John de Scalers who died in 1467. At the restoration of 1868-69 the tomb was moved to its present position to make room for the organ and when the tomb was reset the panels on the west side were reversed. In 1949 it was found that the marble slab did not belong to it. 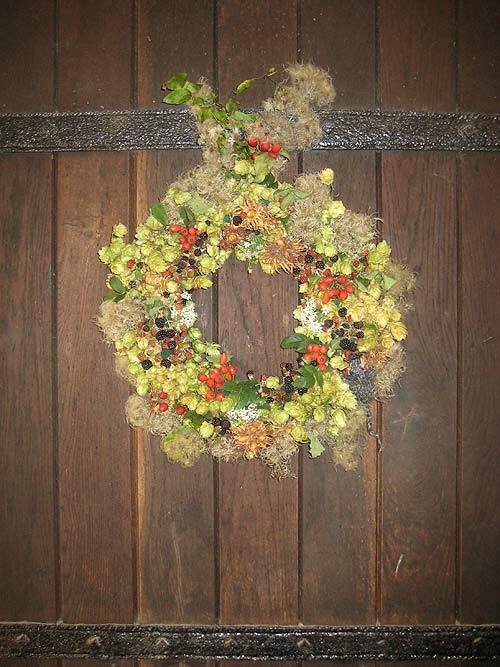 Some of the brasses recorded were removed in 1643 and some were stolen in the nineteenth century. In 1949 the Rev Clare reports having seen an indent under the choir stalls to John More who married into the de Sealers family -1493. The Tempests followed the de Scalers as Lords of the Manor from about 1608 and a marble slab bears the memorial to Thomas Tempest 1644 and his wife Martha 1652. The Pickerings bought the manor from Martha and four memorials remain from 1661-1732, each one bearing enough information to piece together their life story. 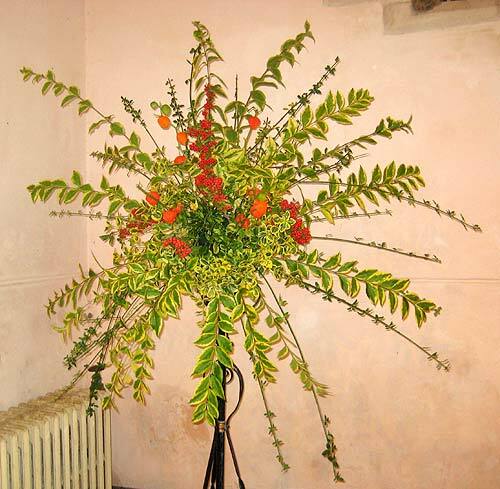 There is also visible the memorial to Elizabeth Glover, companion to Dame Grace Pickering. 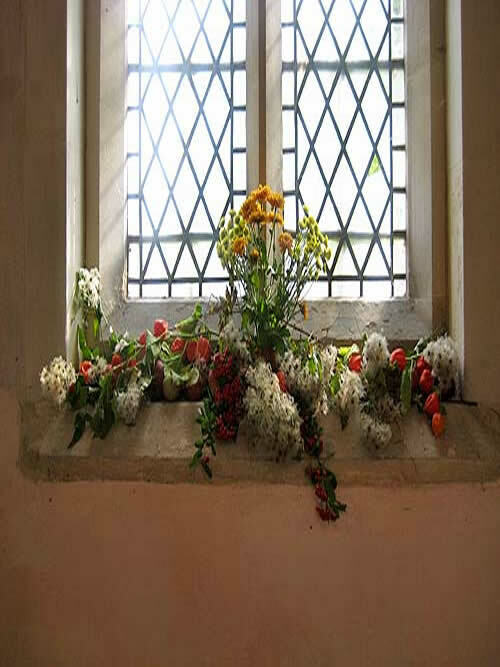 On the north wall there is a plaque to the Rev Allen Hurlock, for 55 years vicar of the parish, who died in 1853 and to his wife who died in 1845. 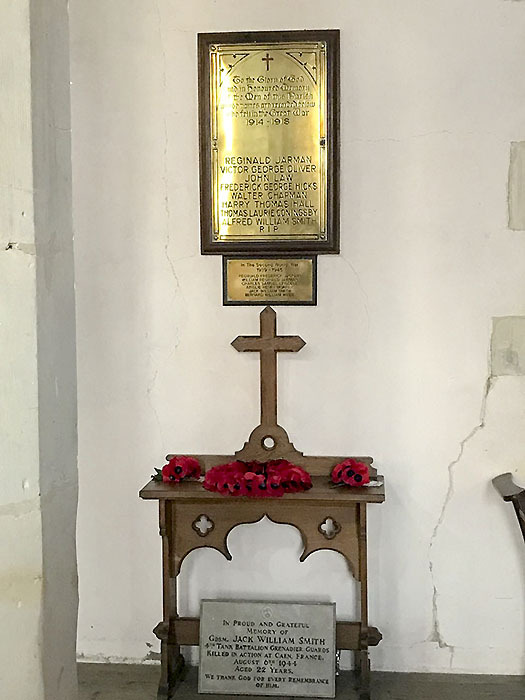 In the north aisle is the tribute to the fallen in two wars and all around the church are to be found various memorials provided by the families to commemorate their loved ones. 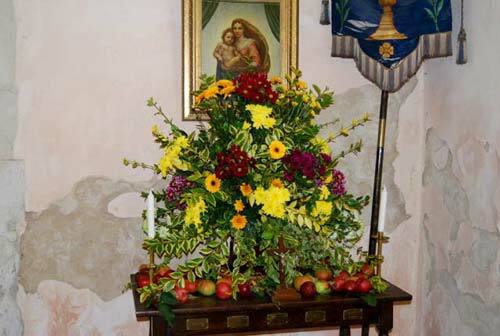 Throughout the years there have also other been other gifts by parishioners of chalices, pattens, candlesticks and bibles, the earliest ones being from Dame Grace Pickering in the early 1700s. 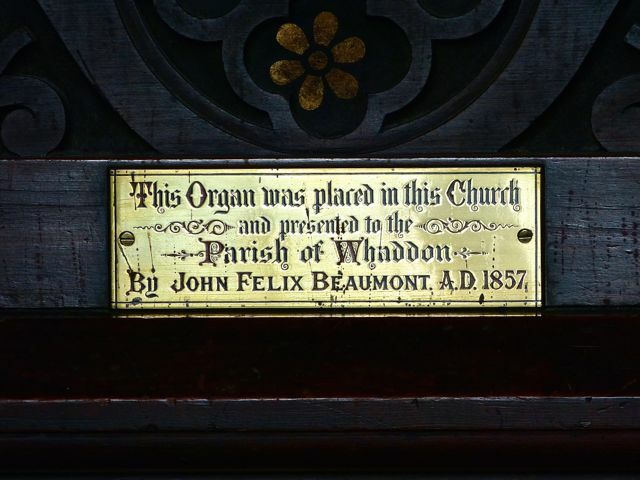 The organ was presented to the church in 1857 by Mr John Felix Beaumont of Town Farm. 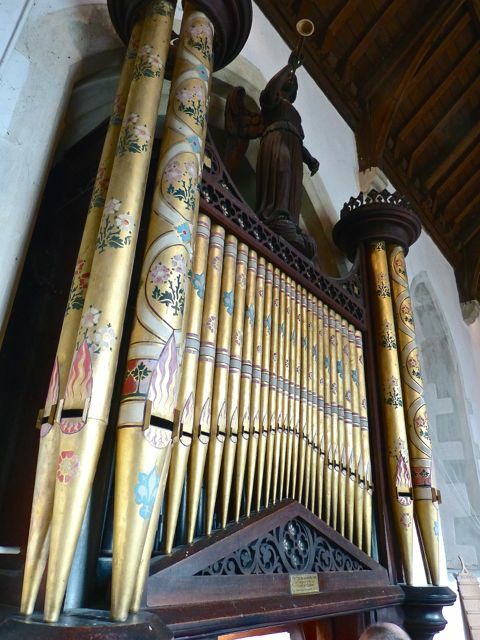 The instrument, which was originally built as a chamber organ, was bought by Mr Beaumont from a music dealer and he had the instrument restored by JW Walker, Organ Makers, who did further work, adding to it and modifying it in 1864 and again in 1869, making up the organ we see today. 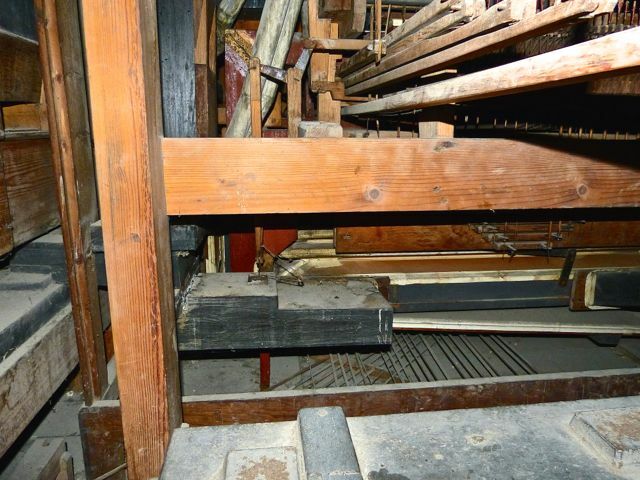 During the church renovations of 1868-9 the organ was taken down and placed in the Royston Institute (now the Town Hall), during which period, any profits arising from its use were divided between Whaddon Church and the Institute. Before the advent of electricity local boys were employed to work the bellows. 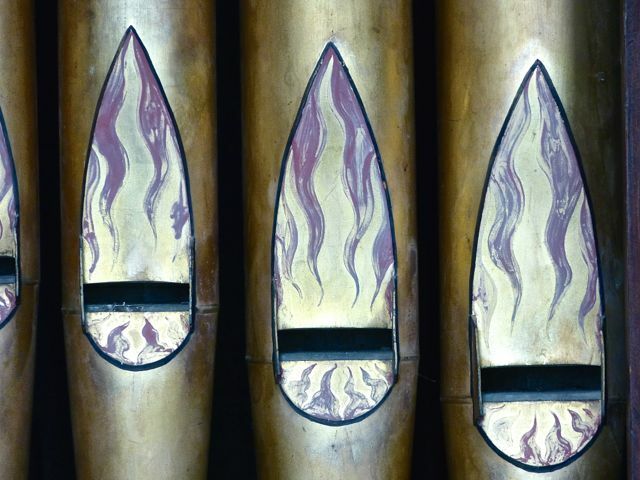 The amount of air required varied with each organist. 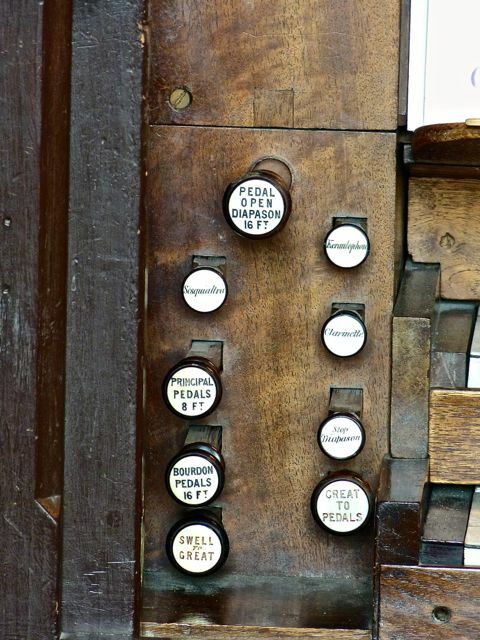 Two traditions grew up around the organ. 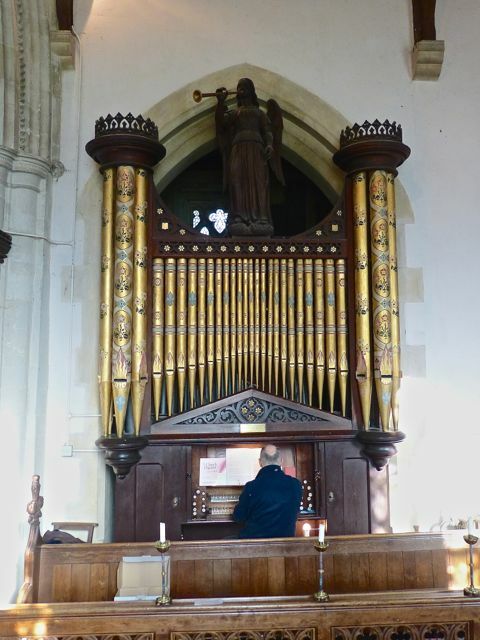 It was originally thought to have been made by John Snetzler (1710-1785), who was born in Switzerland, but the organ is now thought typical of the work of JW Walker. Also it was thought to have come originally from Manchester Cathedral. 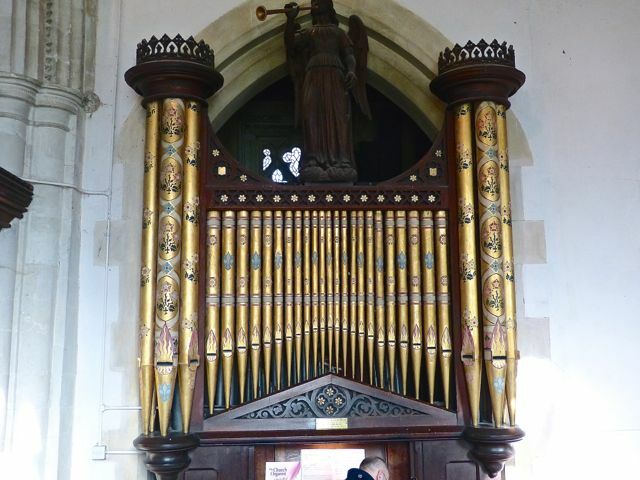 The archivist from Manchester Cathedral was unable to verify this, but the Cathedral organ was substantially altered in 1857, so part of it could have found its way into Whaddon's organ, and certainly the fine carved angel, blowing a gilded trumpet which surmounts the organ case, does suggest a former position in a great church. 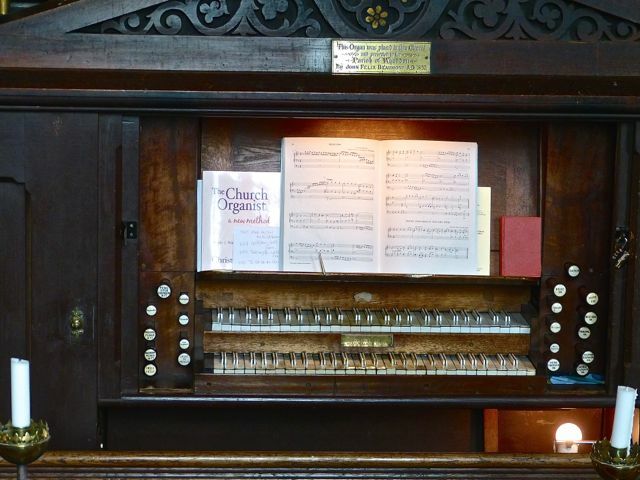 It was described in 2008 in a report commissioned on the history and condition of the organ 'as a precious instrument... historically interesting... hardly altered since 1869... musically beguiling and well suited to the church'. 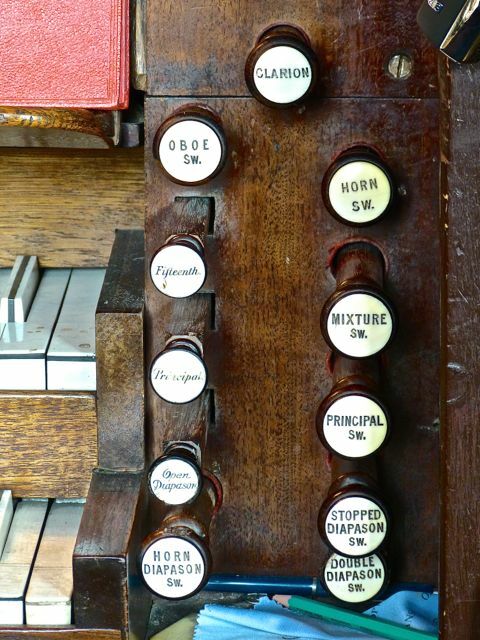 Over the years it has been enjoyed by many visiting organists. The clock on the south facing, wall of the tower is the gift of Dame Grace Pickering, second wife of Sir Henry Pickering, Baronet. Her will was proved in 1733. 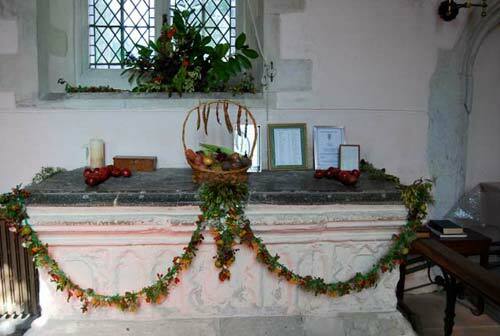 I give and bequeath to the parish church of Whaddon ... fifty pounds of good & lawful money of England, fforty of it to sett up a good Clock in the steple of that church (if l dont happen to do it as I designe in my life time) with handsom Dialls each way, and the other ten pounds to keep it in repair and wound up as long as it will last and then I think the parish may afford to do it for themselves without thinking much of it. Why has the clock only one dial in spite of her request? 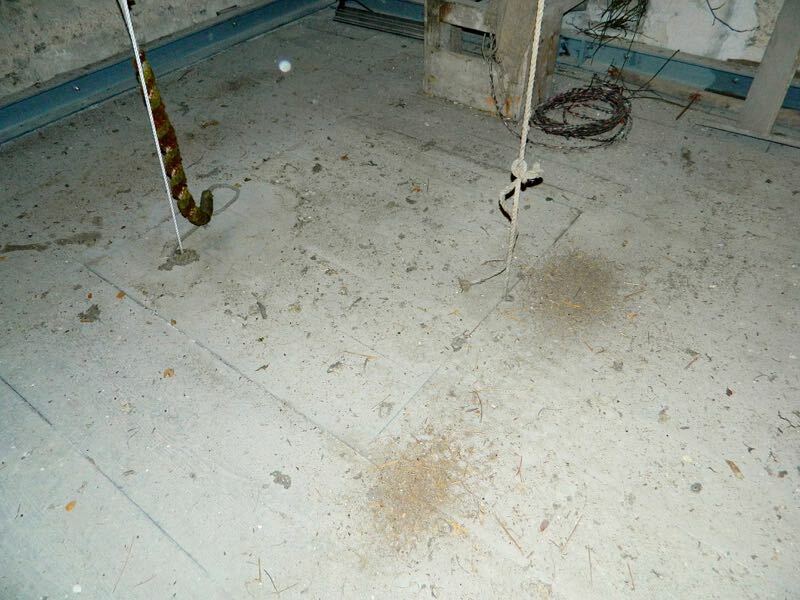 There is evidence in the tower that an attempt was made to provide a dial on the north side. Why the work was abandoned we do not know. Perhaps it was too difficult. When the tower was repaired in 1894 a new stone dial was given to the clock to replace the old lozenge-shaped dial which had been made of red wood and painted blue. The bells in the tower bear the inscription MICHAEL DARBIE MADE ME 1671. 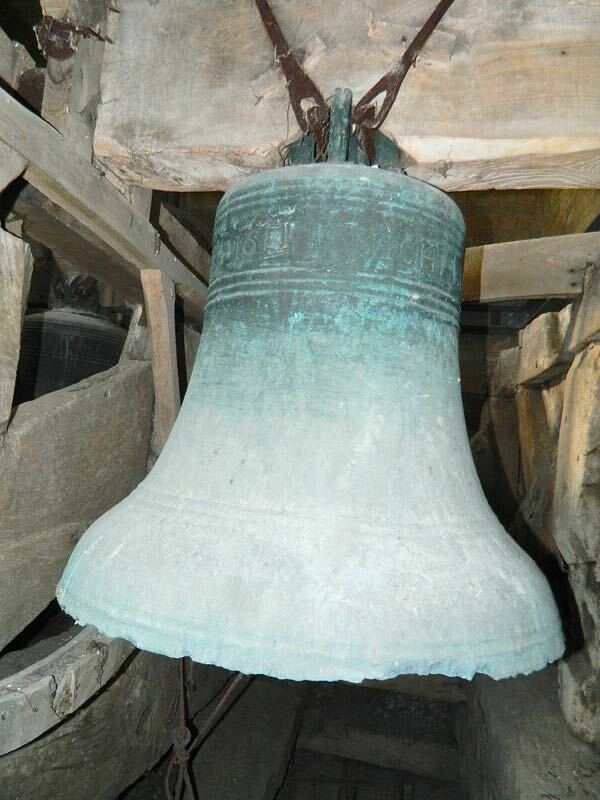 However, Darbie's reputation amongst bell founders was not very high and it is likely that he recast older bells to make the peal in Whaddon as it is known that there were bells here before the Reformation. 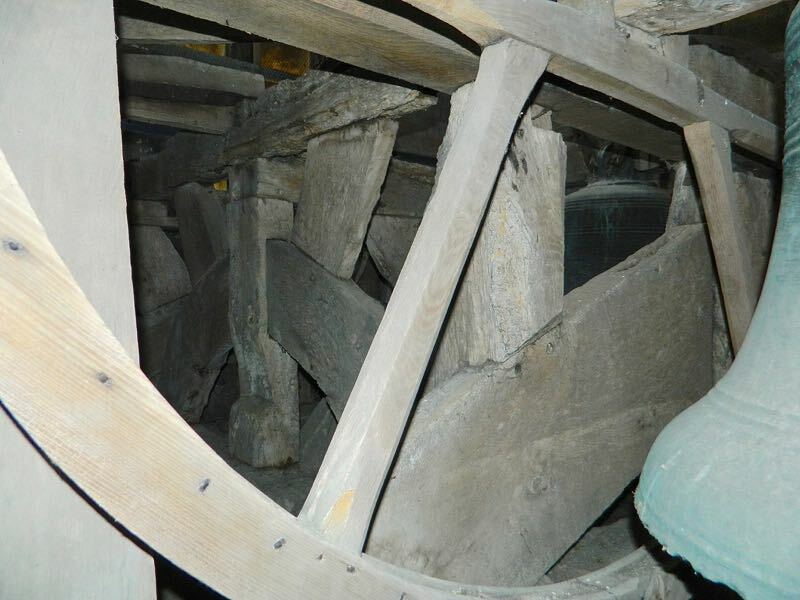 The massive oak bell-frame (15th century) made of roughly squared tree trunks, is older than the bells and bears signs of having housed a peal differently arranged from later bells. The coloured three-light east window by Gibbs 1868 was given to the church by the Beaumont family in 1868. It is to the memory of William 1856, Elizabeth 1866 and William jun. 1854. This was badly damaged by blast in the last war. It was repaired by W.H. Constable of Cambridge in 1948 and very little new glass had to be supplied. The face of Our Lady in the middle light, which had been badly cracked, is the original face. 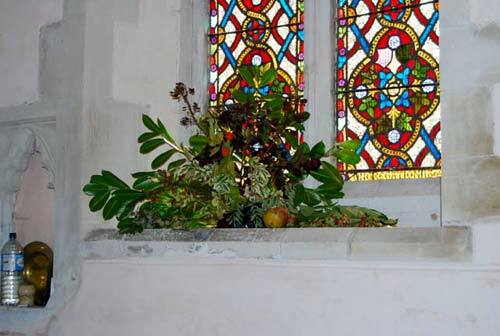 The coloured window on the south side of the chancel was donated by the congregation in 1869. In 1948 Constables of Cambridge made up a quarry of pieces of ancient glass, found by a relative of Mrs Clare, in the ruins of Ypres Cathedral, during the First World War. 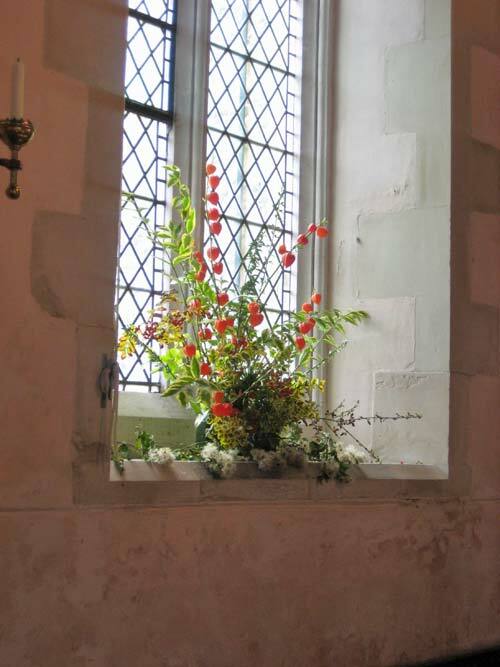 This was set in the middle of the window on the south side of the chancel. Outside in the porch are two ancient stones. These were unearthed from a rock garden outside the vicarage in 1943. The Rev Clare was told that whilst repair work on the chancel was being undertaken during the incumbency of Rev Ireland (1881-84), these two stone brackets which had supported the stone slab on the tomb of a Mrs Fitzhugh (1727) had had to be removed and were used as supports for a flat stone portico over the door of the vicarage. After the fire of 1904 when the vicarage was burned down, they were buried in the rock garden. 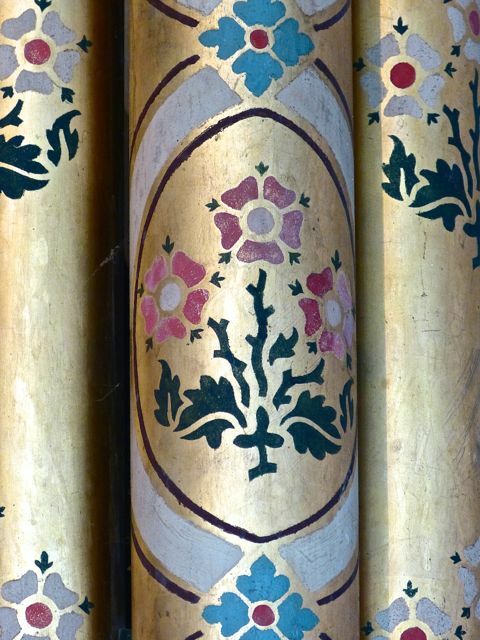 The design of these stones with scrolls with facets instead of the usual roll are quite rare; the Rev Clare placed them in the porch. Worthy of inspection is a large collection of carved heads of people and animals and other simple designs which adorn the cornices under the battlements and beside the doors and windows The ones on the south side are in the better condition; those on the north side being much weathered. 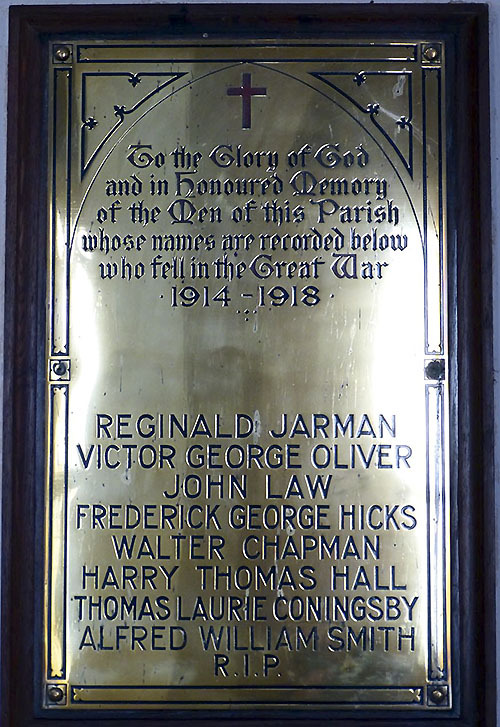 Whaddon's war memorial is inside St Mary's Church. 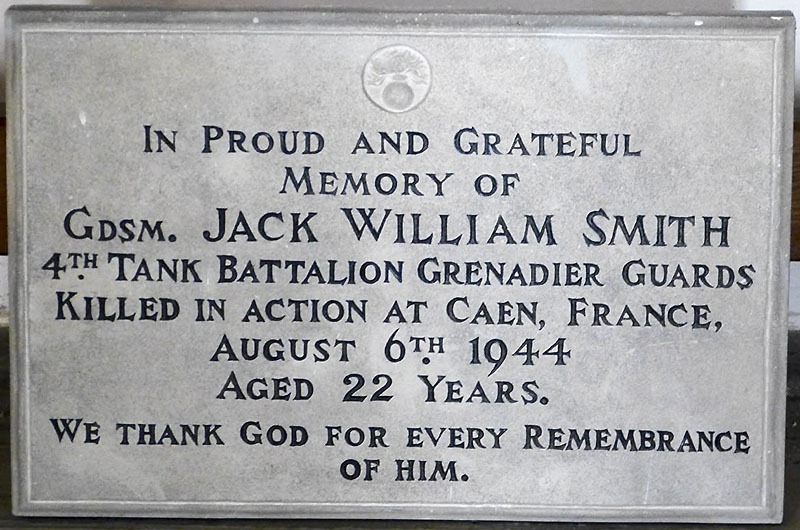 It consists of three elements, brass plaques dedicated to the fallen of World War I and World War II, and a separate stone commemorating Jack Smith, who is named among the dead of WW2. Every year at the Remembrance Service in November, the names on the plaques are read out. 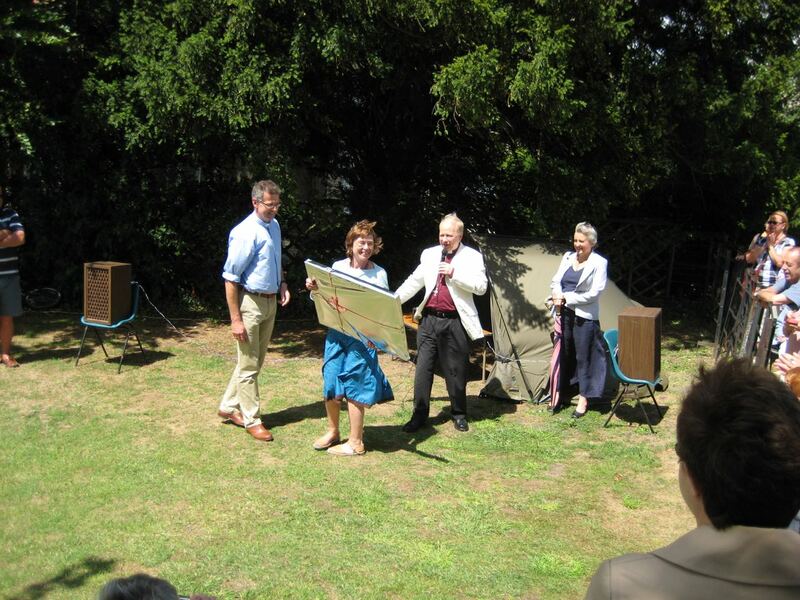 Villagers who remember Edward Ted Webb, lifelong resident of the village and chairman of the Parish Council until not long before his death in 2008, will recall him reading out this list each year. He would end his reading with the words …and my brother, Bernard William Webb , a most poignant moment. Ted's brother was killed in a bomber crash over Germany in 1944. 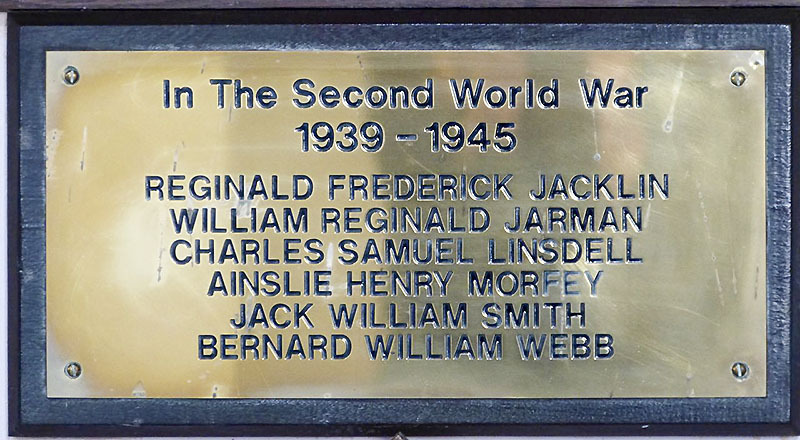 There is an entry for this memorial in the database of memorials of the Imperial War Museum (albeit with the wrong location). The following photographs were taken by Nigel Strudwick in January 2017. 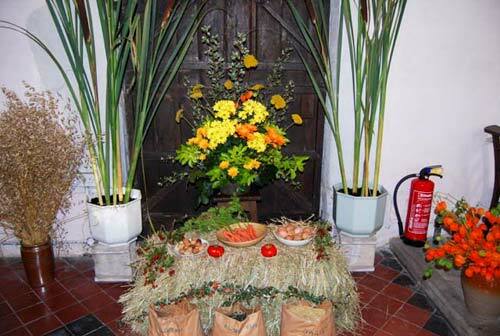 St Mary's has a choir that performs for special events in the Church Year, such as Easter, Harvest and Christmas. If you are interested in coming along, please contact Helen Strudwick at choir [at] whaddon.org. This description comes from the guide to the church by S and J Ralls on the adjacent tab. 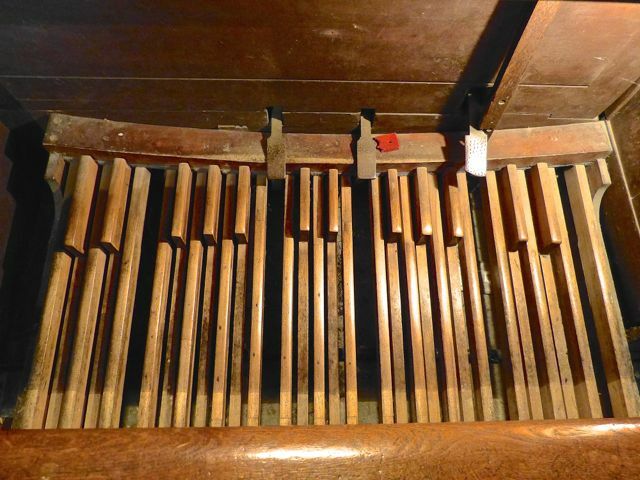 Two traditions grew up around the organ. 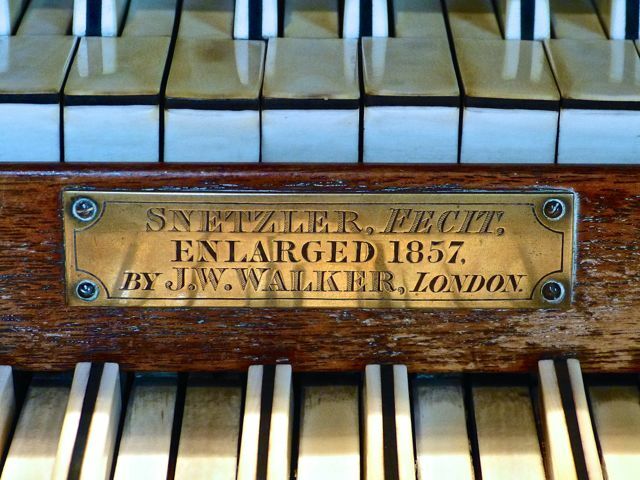 It was originally thought to have been made by John Snetzler (1710-1785), who was born in Switzerland, but the organ is now thought typical of the work of JW Walker. 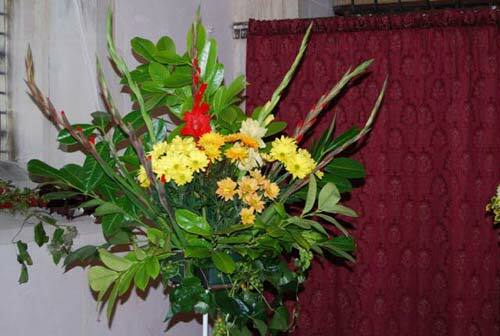 Also it was thought to have come originally from Manchester Cathedral. 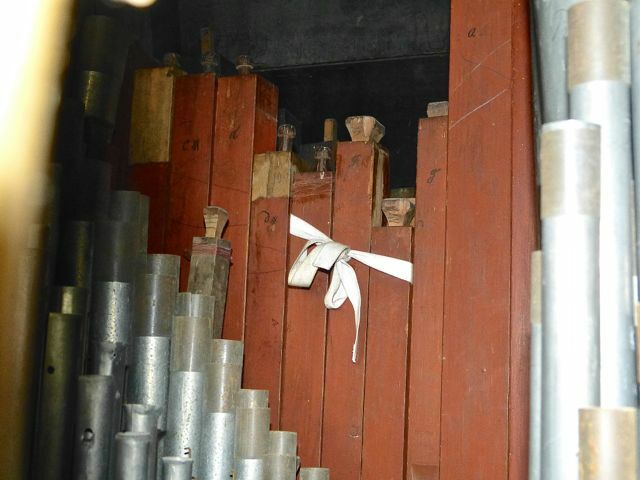 The archivist from Manchester Cathedral was unable to verify this, but the Cathedral organ was substantially altered in 1857, so part of it could have found its way into Whaddon's organ, and certainly the fine carved angel, blowing a gilded trumpet which surmounts the organ case, does suggest a former position in a great church. 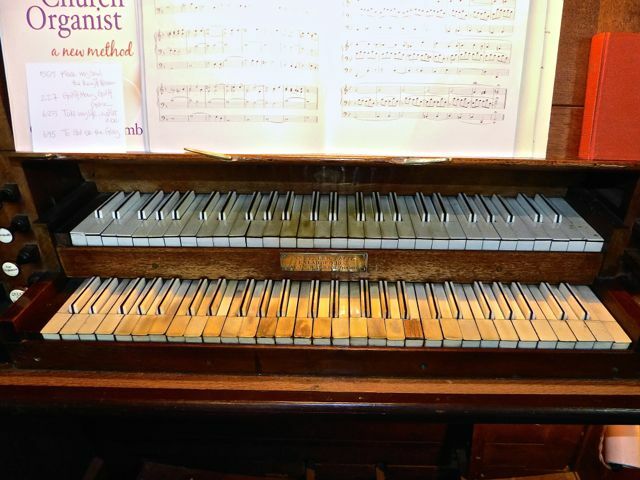 It was described in 2008 in a report commissioned on the history and condition of the organ as a precious instrument... historically interesting... hardly altered since 1869... musically beguiling and well suited to the church . 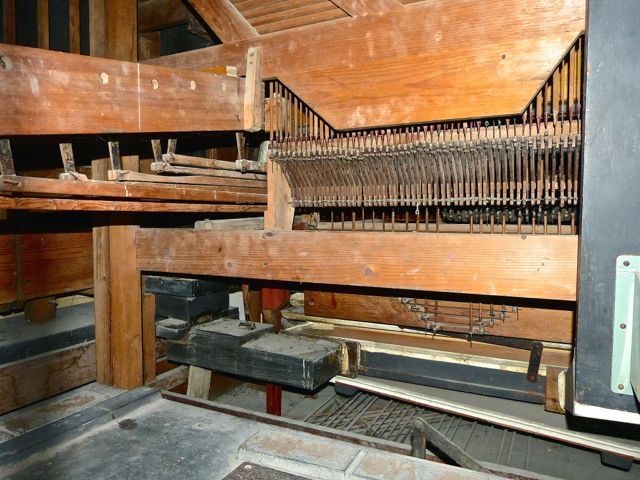 Over the years it has been enjoyed by many visiting organists. 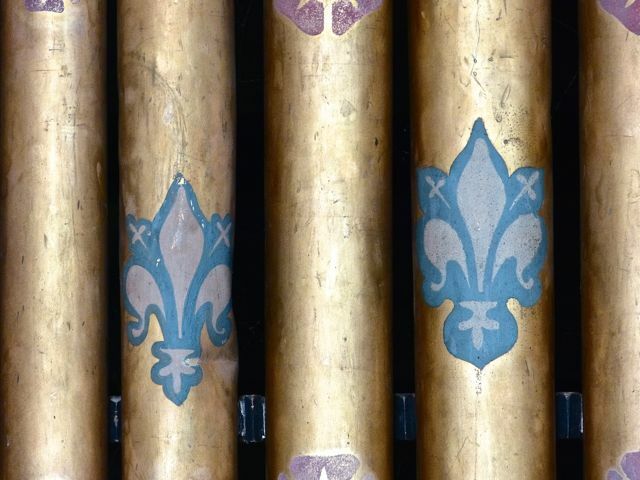 The fame of the organ extends beyond the parish, enticing, for example, a group of Dutch visitors to St Mary's in October 2001 as part of their tour to celebrate The Beauty of the British Organ . 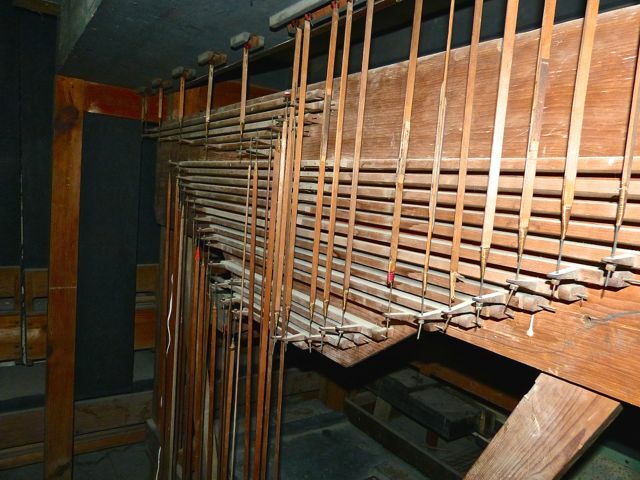 The organ also features in the The National Pipe Organ Register. 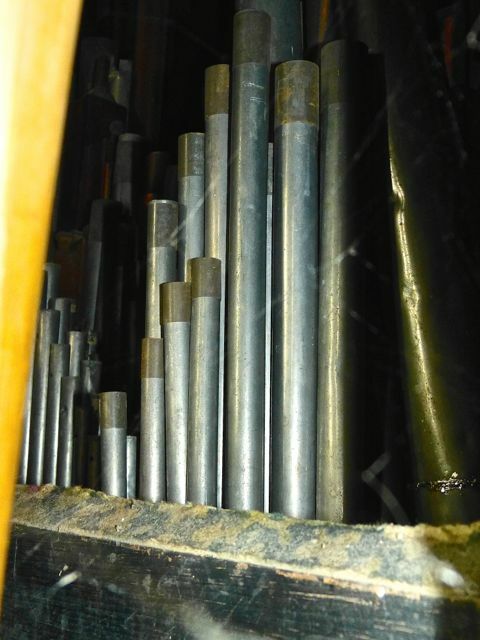 Today the organ is much in need of maintenance, and the photos in the adjacent tab were taken in March 2016 as a precursor to fundraising for it. 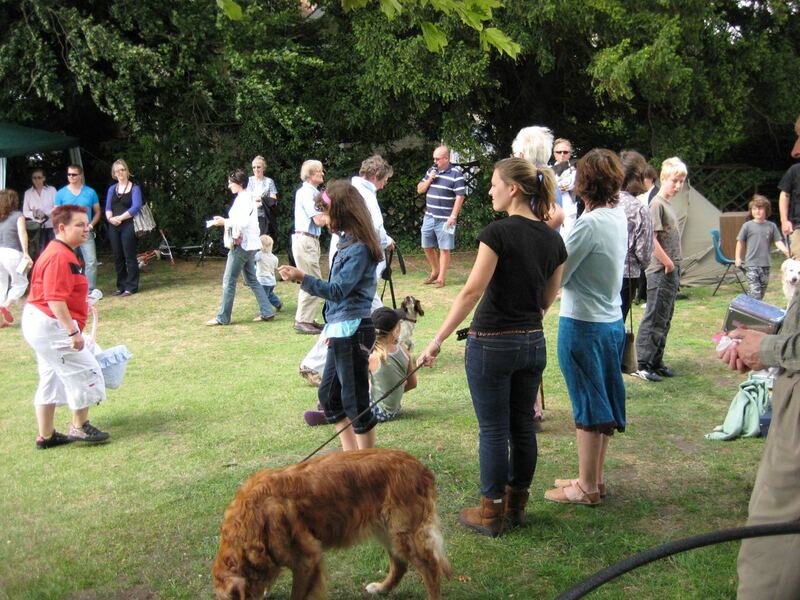 The following photos were taken by and are © Karen Coningsby. 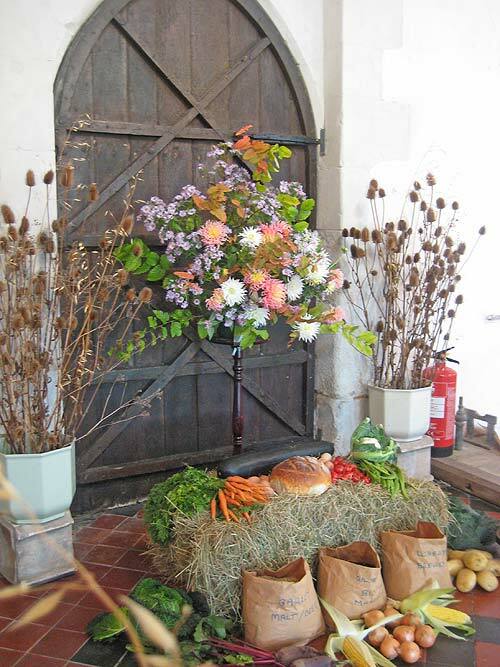 This year's Harvest Festival was held on Sunday 28th September and once again the church was beautifully decorated with flowers and a variety of produce grown in parishioners' gardens (and those of their families and friends). 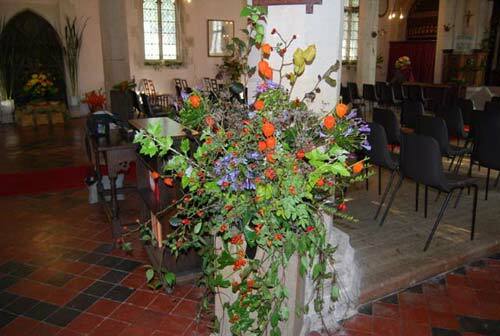 A huge pumpkin 'topped-out' the display on the font, while floral decorations brought colour to the window ledges and every corner of the church. 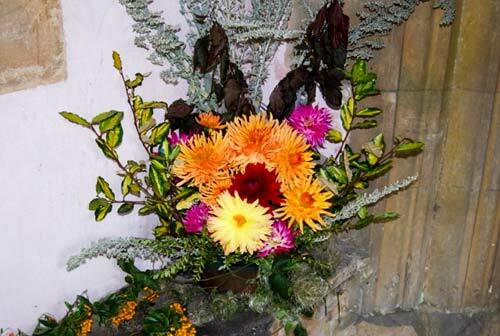 The decorated church provided a fitting setting for the Harvest Service led by Rev Caroline Yandell and which included a performance by the Whaddon choir of 'O Lovely Peace' , adapted from a duet from Judas Maccabaeus by Handel. 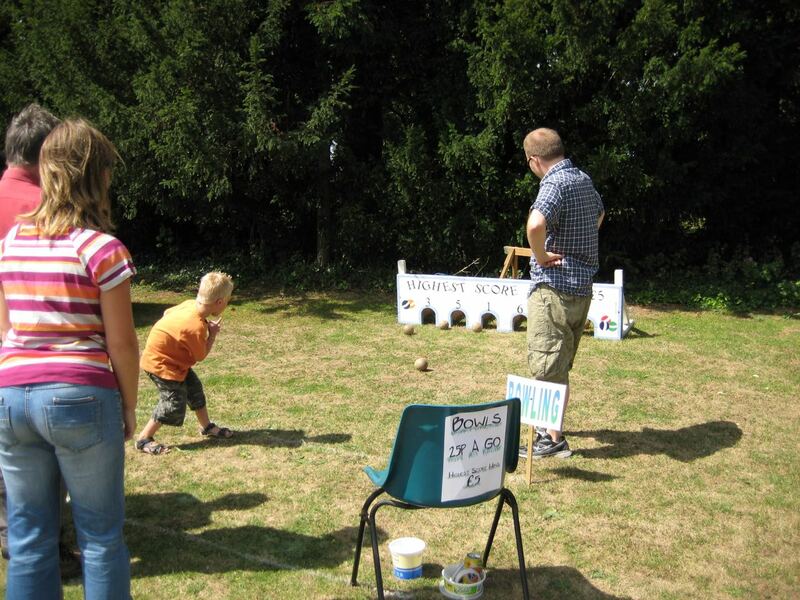 Images from the Church Fête 2006.